The wail of an inline four-cylinder engine, front wheel skimming just above tarmac on a full-bore launch and a 0-100kmph time of 4 seconds remind of sportsbikes, don't they? Certainly not adventure tourers, no? But that's what the 2019 Kawasaki Versys 1000 did when I tested it! I'd ridden the older version very briefly so when I picked up the updated, 2019 Versys 1000 from the Kawasaki I was in for a bit of a surprise. I'd expected a big, heavy motorcycle (which it is) that puts its power down in a mild, friendly manner. The Versys 1000 was anything but that. Firstly, not many adventure tourers on the planet are powered by an inline four-cylinder engine borrowed from a sportsbike! The Versys 1000 is powered by the very engine that powers the Kawasaki Z1000 and Ninja 1000. Of course, the motor has been detuned and offers 120PS on the Versys (as compared 140PS on the Z and Ninja), but it is still very potent. Interestingly the engine remains unchanged for 2019, though the bike has received a comprehensive update. The biggest change is the design. The previous version wasn't very appealing and many were turned off by its looks. In fact the 1000 looked a lot like the Versys 650 and thus lacked the premium appeal of a full-sized ADV. Kawasaki has addressed the issue rather well, as the front end is now inspired by its sportsbikes, most notably the Ninja ZX-6R, meaning the face looks a lot more aggressive and appealing now. Headlights are full-LED units while the revised flyscreen can now be adjusted from the saddle itself. The engine is packed in closely, while the seat is super-wide and long. Given the 840mm the seat height swinging a leg over will be an issue for shorter riders though. I'm five feet, 11 inches tall but was just about tip-toeing the bike. 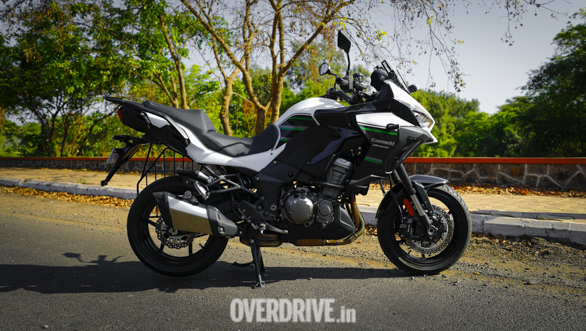 Like before the Versys 1000 runs on 17 inch wheels shod with superbike-sized tyres  120/70 upfront and 180/55 at the rear and these clearly point towards its road bias and also add a lot of visual mass. Kawasaki has also updated the electronics suite. 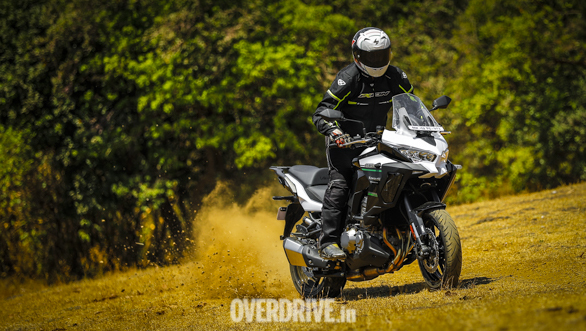 There's two power modes and three traction control settings (you can also turn TC off) like before, but the Versys benefits from the addition of ride-by-wire now, which has allowed Kawasaki to equip it with cruise control. The bigger news though is the inclusion of a Bosch-sourced five-axis IMU which offers information about your lean angles on both sides now. Of course, the IMU's primary function is to modulate engine power and brake force to aid its cornering abilities. The 2019 Versys 1000 also gets Kawasaki's intelligent anti-lock braking system derived from its supersport machines and braking duties are handled by dual 310mm semi-floating petal discs upfront. That is a lot of equipment! 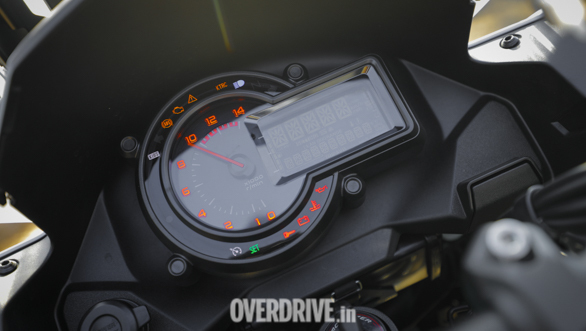 Kawasaki has only launched standard version in India and not the SE though, which gets more equipment like a quickshifter, heated grips, TFT display instrument cluster and semi-active suspension too. Of course, the standard version itself is a lot of motorcycle. The inline-four engine plays a wonderful soundtrack at full chat and also has a bit of the Z1000's intake howl. It also boasts a meaty midrange punch, with the party beginning at just 4,000rpm. But cross 6,000rpm and things go berserk and the Versys turns into a rather large projectile. It is a big motorcycle and given the frantic performance, it's easy to get into trouble rather quickly. I took a few minutes to get used to the size and power delivery but once acclimatised, the Versys felt easy to rein in. And once used to the size I was also comfortable maneuvering through traffic though I had to bear in mind the fact that the Versys is a 255kg motorcycle! The 21-litre fuel tank doesn't help, while the mirror stalks are a little too wide. They offer great visibility but I had to be mindful in traffic. Like most Kawasaki big bikes the Versys 1000 also impressed with the engine's heat management and the fan did come on regularly in traffic but the heat almost never got to my legs. Once out of city confines, I let the 120 ponies loose and the Versys 1000 turned into a supersonic mile muncher. Accelerating hard I found that the four-pot motor's party ends at just 10,000rpm, though the engine felt like it has more to offer. Getting to ridiculously high speeds is cakewalk and in fact the bike is so quick, it crosses 160kmph in a flash! 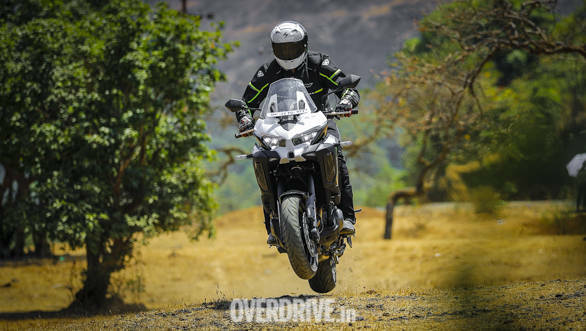 The bike feels extremely stable at high speeds while also feeling supremely comfortable and a lot of that has to do with its well-tuned suspension. The long travel forks offer impressive cushioning over undulated roads and also soak up bumps and potholes well. The rear monoshock gets a remote knob for adjustment like before and also offers great comfort. I can easily imagine clocking a 1000km day on the Versys 1000 and getting off the bike without feeling too tired at the end of it. The windscreen works well too, without any wind buffeting, thereby helping reduce fatigue. Needless to say the Versys is meant to munch miles all day long, which shows in its handling around corners. The long travel forks cause the front to dive when you brake hard, though there's ample retardation from the brakes. 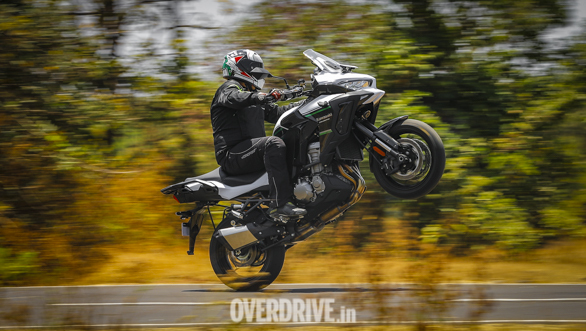 Yes, the Kawasaki Versys 1000 can fly too - the long travel suspension lets you take-off and land safely, should you give it a try! 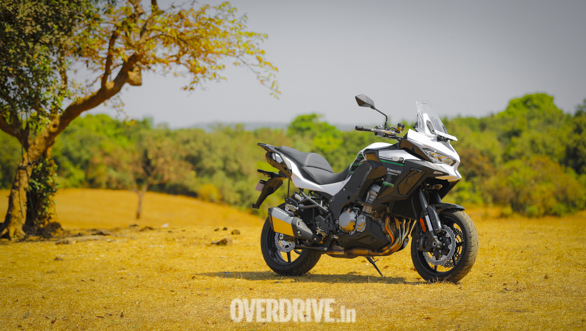 The Versys 1000 has always been likeable but unfortunately hasn't received the appreciation it deserves, in India at least. 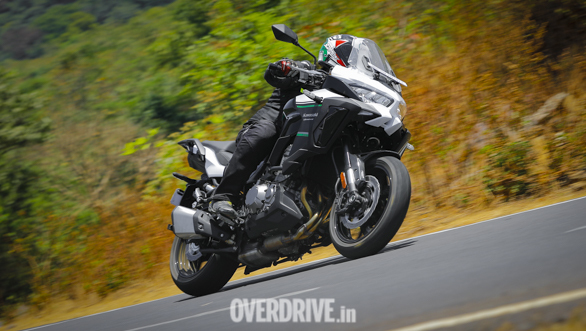 Its engine is one of the smoothest inline fours even today and offers brilliant acoustics and strong performance  the bike clocked a 0-100kmph time of 4.06 seconds in our VBOX test, which is almost superbike category! Comfort levels are excellent while the dynamics will keep you happy, unless hunting for apexes feverishly. This is certainly a motorcycle to consider if you are looking for a comfortable highway tool that also has a sporty edge to it. And it is a Kawasaki, so reliability is pretty much a given. 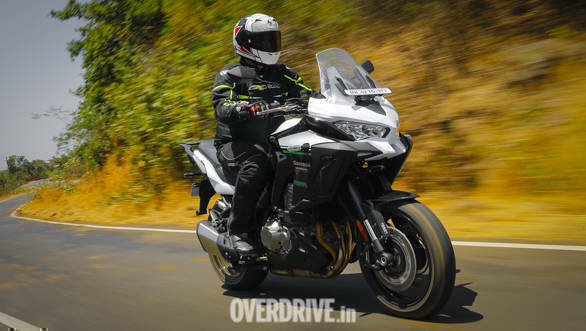 But most importantly, Kawasaki is assembling the Versys 1000 in India now, which has allowed it drop the bike's prices by over Rs 2 lakh, which is a huge price cut. Retailing at Rs 10.89 lakh the Versys 1000 in fact costs lesser than some of the middleweight adventure tourers, which is a steal in my opinion. Transcontinental touring just got more inviting!